Fabulous location and lovely interior. For the couple looking to get away from it all - this is as far as you need to go. You and 2 dogs welcome. Grand View Cottage is a traditional-style, although modern detached crofter’s cottage located in the crofting township of Claddach Kirkibost on the west side of North Uist. Sleeps 2 in great comfort and you can bring two dogs for some awesome walks straight from the house. The house sits on its own so you have lots of privacy. Beach 100 yards. Shop 2 miles, pub and restaurant ½ mile. All on the ground floor.Living/dining room: With open fire, 32" Freeview TV and CD player.Kitchen: With electric cooker, microwave, fridge/freezer and washing machine.Bedroom: With double bed.Shower room: With shower cubicle and toilet. Electric heaters, electricity, bed linen and towels included. Initial logs and coal for open fire included. The island can be reached by ferry on the Road Equivalent Tariff fare - an economical way of travelling. Cosy and inviting, it has an open fire in the living room, and is well equipped to make an enjoyable stay. It is just a short stroll from the fabulous stretch of sandy beach of Kirkibost and Baleshare which form part of a Site of Special Scientific Interest.The Uists have so much to offer for outdoor enthusiasts; artists and photographers, as well as bird watchers, walkers and people with an interest in archaeology find this area truly spectacular. Birdlife and wildlife include eagles and corncrakes, and the RSPB reserve at Balranald is only a short drive away. Whales and basking sharks visit in the summer, and the grassy plain of the Machair is a mass of colour with abundant wild flowers. You can also enjoy walking on the pristine, white, sandy beaches on the west side. There are many historic and archaeological sites to explore including the Bonnie Prince Charlie Trail and Trinity Temple at Carnish. The Uist Outdoor Centre in Lochmaddy offers a wide range of activities if you enjoy sea kayaking, diving, boat trips to the Monach Isles and St Kilda, whale watching and so much more. The sunrises, sunsets, seascape, landscape, and dark skies will amaze you. Sweet little detached cottage in a rural setting near Lochmaddy on the remote west coast of North Uist. Sleeps six people in three bedrooms. 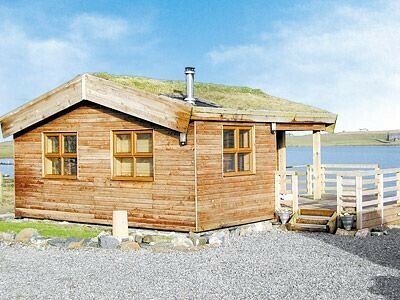 An Taigh Fiodh (the Wooden House) is a self-catering apartment on the island of Grimsay in the Outer Hebrides/Western Isles.